The National Chairman of the Peoples Democratic Party, PDP, Prince Uche Secondus has reacted to the invasion of the National Assembly by security men, thus preventing staff and lawmakers from gaining entrance to the complex. The National Chairman said that Britain should not allow its environment to be turned into a haven for anti-democracy conspirators. 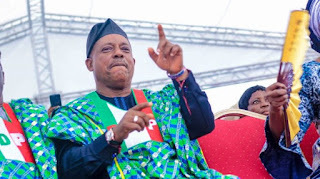 Prince Secondus said in a statement from his media office, signed by Ike Abonyi that the President left the country to UK for 10 days medical leave to enable the nefarious activities they lined out against democracy be executed in his absence. He said that the final plan for the invasion of National Assembly was concretized when the minority leader, Senator Godswill Akpabio visited the President in London at the weekend. According to Prince Secondus, “the siege in National Assembly leaves no one doubt that President Muhammadu Buhari and his ruling APC are out to destroy this hard earned democracy all because they can no longer fit into it. “Secondus also salutes the courage of the Vice President in sacking the Director General of the DSS, Lawan Daura to show that Nigeria cannot be hijacked and ruled by cabals. “The National Chairman said that democrats all over the World do not need any further evidence to show that President Buhari and APC have suspended democracy and are now running a draconian administration. He noted that “Nigerians passed through this route before in their struggle to restore democracy in this country and the will of the people and that of the almighty prevailed and this time cannot be an exception.